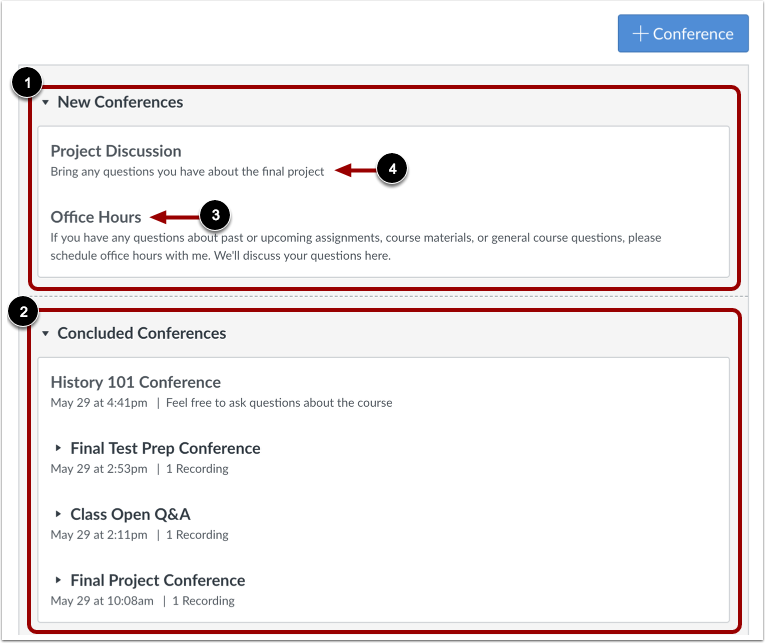 How do I use Conferences in a course as a student? The Conferences page allows you to view all the conferences within a course. As a student, you can join conferences where you have been invited to participate. In student groups, you can create new conferences, start conferences, and manage concluded conferences. 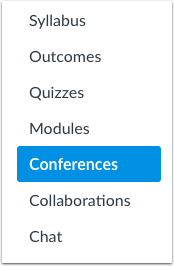 In Course Navigation, click the Conferences link. You can view conferences where you have been invited to participate. Conferences are grouped in two parts: New Conferences  and Concluded Conferences . Both always display the conference name  and description . New conferences will be listed in the index, but they cannot be accessed until the host has started the conference. When the conference is available, click the Join button . Once the conference has started, the conference status shows as in progress . You can join the conference for as long as the Join button is available. Some conferences only allow you to join the conference for a specific amount of time. Concluded conferences display in the Concluded Conferences section. Each concluded conference shows the title, date, and description of the conference. When your conference has concluded, click the name of the recorded conference . To replay the conference, click the recording format link . The recording format displays as either a presentation or a video. The recording format link does not appear until the conference has been rendered for playback. Depending on the length of your conference, this process may take several hours. The length of the conference is indicated in hours:minutes (e.g. 0:18 is 18 minutes). If your conference included closed captioning, the playback bar for the video displays a CC button to view the available captions. Note: For all basic Conference accounts, recordings are automatically deleted 14 days after the conference ends. Previous Topic:How do I delete a collaboration as a student? Next Topic:How do I create a conference in a student group? Table of Contents > Conferences > How do I use Conferences in a course as a student? Re: Conference questions - new admin.